- Couple's Retreat - prime location, spacious, views, private deck, & fireplace! Property 5: - Couple's Retreat - prime location, spacious, views, private deck, & fireplace! The Mountains Are Calling! Cute, Convenient Loft-Style Studio. Property 9: The Mountains Are Calling! Cute, Convenient Loft-Style Studio. Riverside Condo with Mountain and Town views and updated furnishings. 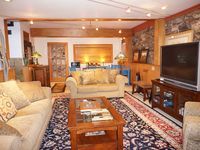 Property 14: Riverside Condo with Mountain and Town views and updated furnishings. Charm On Main St. Close To Everything! Property 41: Charm On Main St. Close To Everything! Newly updated furnishings, nice all around. kitchen needs a vent. Rating Details: The property manager was very helpful. The vacation rental was spotless. I was very happy with the location. I was very satisfied with the condition of the vacation rental. Overall, I recommend this vacation rental. Reviewer Comments: The unit is in the perfect location for walking to all the restaurants in town and to the Gondola. It was comfortable and warm and great living room area to hang out in.